Caption slip reads: "Photographer: Lou Mack. Date: 1960-01-07. Assignment: Amphora find. 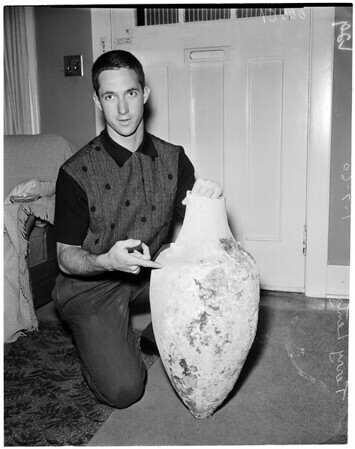 Terry Lentz, 22, with 1500-2000 yr. old Amphora, Siamese cat Ming looks into opening. Terry with amphora and trophies he has won in skin diving".